What’s Best for Private Charity and Government Welfare … Jobs! For purposes of discussion, it will be appropriate to define the two components of charity in America. Private charity is comprised of individuals and non-governmental institutions giving freely to the needy and without government intervention. And government charity is forcing transfers of money from taxpayers to citizens identified by the government as needy. Payroll taxes are the largest source of funds for government charity called Social Security and Medicare. All working people, anyone who files a W-2 form with the IRS, pay payroll taxes. Payroll taxes are currently leveled at 7.65% of the employee’s wages and 7.65% leveled on businesses who hire an employee. The aggregate amount of 15.3% is the approximately total amount that would have gone to the employee but for the payroll tax. Payroll taxes are specifically used for Social Security and Medicare. You never see this money on your paycheck as it goes directly to the government. Income taxes are the second largest source of government charity called Medicaid and SCHIP. Income taxes are paid by most working people unless their wage income is so low that they do not have an income tax liability. Non-wage earners who have no payroll tax, may pay income tax on non-employment income. So for purposes of analysis, we will equate workers and taxpayers as the same people. Using 2006 IRS data, there are about 135 million income taxpayers. The total work force in America is about 150 million people. So, we consider workers and taxpayers the same wonderful people who provide the government with a vast majority of total government revenues and all revenue for government charity. In 2008, taxpayers paid individual income taxes of $1.146 trillion and approximately $450 billion in payroll taxes which equates to half of the $900 billion in total payroll taxes collected from both businesses and individuals. 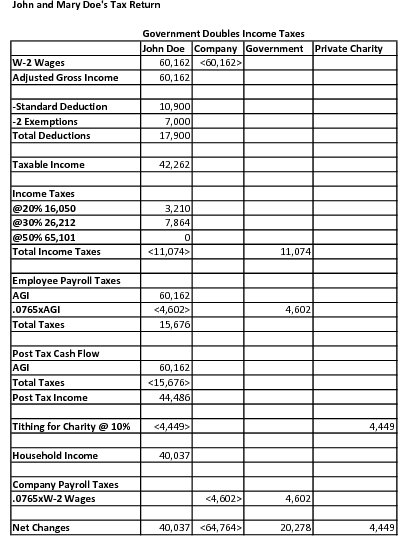 So, working people provided $1.596 trillion ($450 billion in payroll taxes plus $1.146 trillion in income taxes) of the total $2,524 trillion in taxes collected by the federal government. This would be 63% of total government revenue. But honestly, since the other half of the approximately $900 billion of payroll taxes is paid by the employers of working people, this should actually be including in the total taxes provided by working people. The reason is that their employers only pay these taxes as a result of hiring an employee. Therefore, the company would probably be indifferent to paying them to the government or the employee. 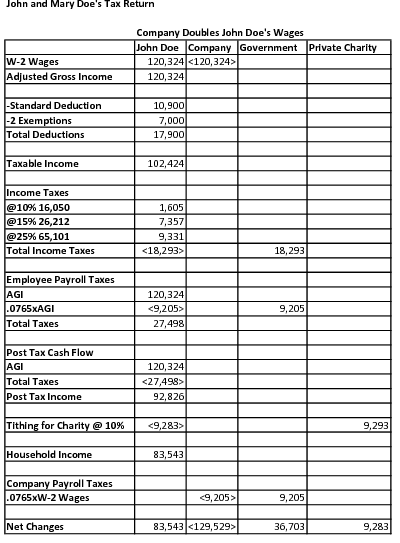 We now revise our total amount of taxes provided by working people to $2.046 trillion ($1.596 trillion plus the half of the $450 billion in payroll taxes paid by companies), or 81% of the total $2.524 trillion in taxes collected by the government. These working people are the main supporters of our federal government, and as we are about to find out, they are very generous. Now that we have attributed all the payroll taxes to working people, we point out that payroll taxes are to be utilized specifically by the government for needy people receiving Social Security and Medicare. As these programs exist current workers would pay benefits to current retirees. And then when the current workers became retirees, other current workers pay for their benefits. For now, please ignore the fact that Social Security and Medicare are both going broke. And this will end up posing a grave injustice to those people who paid their payroll taxes for as long as 45 years and who will not receive the benefits their predecessors received from them. In fact, under the Patient Protection and Affordable Care Act of 2010, older people will definitely have their benefits rationed away in favor of people who may have hardly paid any payroll taxes at all. 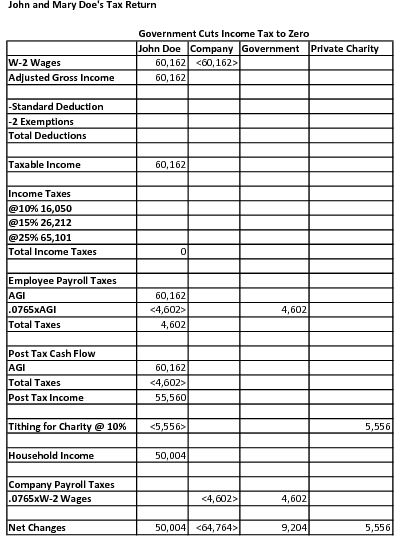 But for purposes of this analysis, payroll taxes furnish the greatest amount of Government Charity to the needy. Now, if we include Welfare from general revenue we can add to this amount of government charity. From the 2008 Federal Budget category of Unemployment, Welfare and other Mandatory Spending, which we assume is for needy people, we find that the aggregate is $324 billion. And this is from general revenue. So, our total government charity is $1.527 trillion ($1.203 trillion + $324 billion) or 53% of all 2008 federal expenditures. This is a lot of generosity courtesy of the working taxpayers. Here is a very simply way to put welfare spending into perspective. There are roughly 5 million people on welfare. This is 1.6% of our total population of 300 million. Perhaps you are surprised that the percentage is so low. If just one-half of the $324 billion (that is $162 billion) was distributed to the 4.96 million welfare recipients, each would receive $32,661 for the year. This amount is just slightly abovethe poverty level for a family of 6. This suggests that each recipient should be reasonably well cared for, especially since the median income for the whole country is $50,303. To provide the median income to 4.96 million welfare recipients would cost $250 billion. The American taxpayers are doing a very good job of taking care of their neighbors and providing an appropriate safety net. When we add total government charity of $1.527 trillion to total private charity of $308 billion, we get a total value of charity of $1.835 trillion. This is an impressive 12.9% of America’s $14.191 trillion GDPin December of 2008. Using the 2006 counts by the IRS, there were approximately 135 million taxpayers or working people. This closely matches the work force in America which totals approximately 150 million people. But many of the have insufficient income to file an income tax return. And this will suffice for our order of magnitude calculations. The average “charity” provided to the needy by the average workers was approximately $13,592 ($1.835 trillion divided by 135 million workers). This is a very impressive number. For the same 2006 year, the total adjusted gross income of all taxpayers was $8.122 trillion. So, the average per taxpayer is $60,163 ($8.122 trillion divided by 135 million workers). If we divided the total worker provided charity per taxpayer of $13,592 by $60,162, we get a “Generosity Index” of 22.6% of adjusted gross income per taxpayer worker. The American worker is an extremely generous person. Now we can state what is not obvious to most people. Taxpayers/workers are the source of all funding for private and government charity for the needy. For all institutional charities that are working with “needy” people to reconstruct their lives in any number of ways, the probably successful end point for those who can enter or re-enter the workforce is to get a good job. Good jobs are most often available at businesses that make good profits. Now “profits” is another word that might bring a frown to many staffers of institutional charities. It reflects a mindset of who is overcharging us to make all those “excessive profits.” So, let’s take a close look at what a profit is in its most basic form. If you are in any business and your revenues exceed your expenses by just one dollar—you profit, you are alive and well with the following expectations: You will be able to pay your employees, your vendors and other costs so that you can continue to provide for your customers, who are satisfied with your product or they wouldn’t be your customers. Your employees will continue to work for you and receive the wages and benefits you pay them, and so will the employees of your vendors whose products you buy. And, yes, you will be able to pay the company’s share of payroll taxes to the Government, and your employees will be able to pay their share of payroll taxes to the Government. On the other hand, if your revenues are just one dollar less than your costs—you are not making a profit. Therefore, you are beginning to lose your ability to pay your employees, your vendors and your other costs. You will soon not be able to sell your products to your customers. And you and your employees will soon lose their jobs and benefits. And all the payroll taxes that you and your employees were paying to the government will drop to zero—and the taxpayers, who are simply just other workers, will have to start paying them unemployment benefits. Now, if the company was making more of a profit, there are three additional things that could be happening. First, you could save the money by putting it in the bank. Your bank would then lend that money to other businesses to expand. Second, you could use it to expand your business by providing your customers with more products. This, of course, would require you to hire more employees and purchase more from your vendors and pay more payroll taxes to the government. Or, three, you could distribute the extra profit to your shareholders, and they could do one of these same three things. Profit is the difference you get from subtracting all your costs from all your revenue. If the number is negative for long, you have a loss and you probably will go out of business. Whereas, if it is positive, you have a profit and hopefully your company will grow, prosper and hire more people. So, if institutional charities are trying to place a formerly “needy” person in the workforce having a lot of profitable growing companies who need more workers is the best thing for them so that they can become former clients! To understand the impacts of this flow of taxpayer money on our economy and charity, we need to trace how they flow through an individual tax return. Please meet John and Mary Doe. Their tax status is that of a married couple filing jointly with 2 exemptions. This is their first tax return as they have recently left the state of needy and have completed their first year of having earned W-2 wages from a job. They tithe 10% of their household income and pay their taxes per the 2008 federal tax schedule. 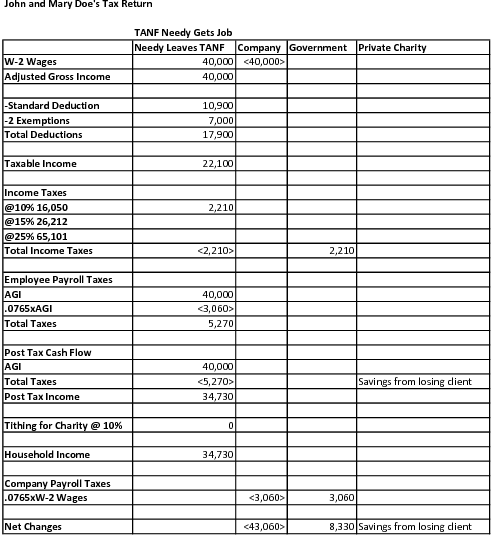 On our spreadsheet we evaluate the following situations: (1) John Doe Gets a Job, (2) Government Doubles Income Taxes, (3) Company Doubles John Doe’s Wages, (4) Government Cuts Payroll Taxes by 50%, (5) Government Cuts Income Taxes to Zero, and (6) Needy Leaves TANF. Our calculations prove that the greatest positive impact on John and Mary Doe, Government Charity and Private Charity is the result of John Doe getting a job. He leaves the needy state and takes control of his life and becomes personally responsible for his support by getting a job. 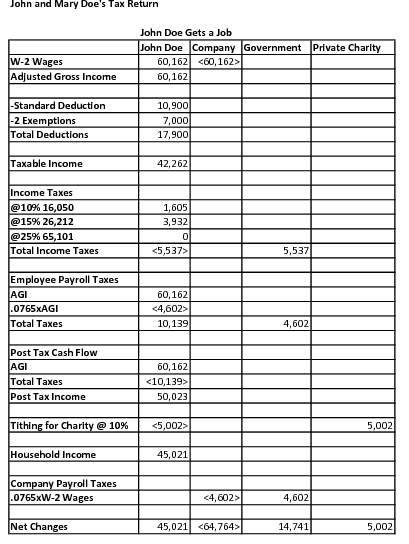 The second most important point is that for John Doe to get a job that pays W-2 wages of $60,162, his employer must be making profits of at least the same amount of money as it pays John Doe in wages and its share of the payroll taxes on his wages. This would equal $64,764 [$60,162 in wages + $4,602 in payroll taxes (.0765×60,162)]. Yes, the company will only offer John Doe a job if it expects to recover all this cost of his employment plus a contribution to profits so that the company can stay in business and grow. So, if you step back from John and Mary Doe, the real source of all Government and Private Charity are healthy, growing businesses that can take the risks of having additional workers and still be profitable. How’s that for an unexpected but not often recognized reality? Companies are what produce the resources for taxpayers to fund Private and Government Charity. And much more obviously, businesses are the source of John and Mary Doe’s household income. Businesses, who must make profits to stay in business, afford a great advance in human dignity by letting people become personally responsible and self-supporting. John and Mary Doe’s fortunes are very adversely impacted when the government doubles their income taxes. Their household income drops $4,984, or 11%, from $45,021 to $40,037. Therefore, their giving to Private Charity drops $559, or 11%, from $5,002 to $4,443. However, Government Charity increases by $5,537, or 37%, from $14,741 to $20,278. So, Government Charity gains progressively as higher marginal tax rates are applied to taxable income. These all seem to be bad effects for households and Private Charity. 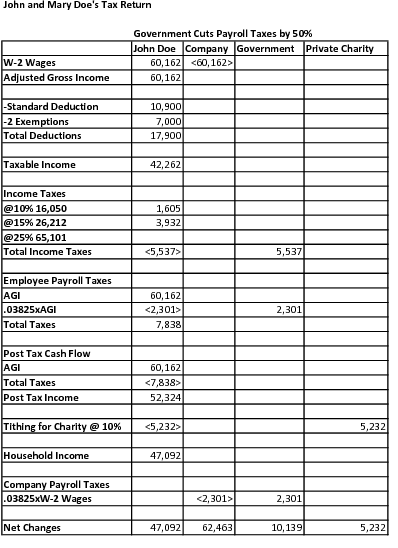 On the other hand, if the government cuts payroll taxes by 50%, John and Mary Doe’s household income increases by $2,071, or 4.6%, from $45,021 to $47,092. Consequently, their support of Private Charity increases by $230, or 4.5%, from $5,002 to $5,232. The greatest positive effect on household incomes would be if income taxes were reduced, for purposes of demonstration, to zero. Under this tax policy, John and Mary Doe’s household income would increase by $4,983, or 11%, from $45,021 to $50,004. And their contributions to Private Charity would increase by $554, or 11%, from $5,002 to $5,556. Finally, both Government and Private Charity benefit as John Doe remains successfully employed by his employer, becomes very productive and eventually doubles his wages. If his income doubled, his household income would increase from $45,021 to $83,543, Government Charity soars from $14,741 to $36,703, 148%, and Private Charity increases from $5,002 to $9,282, 85%. Unfortunately for Private Charity, progressive income tax systems favor Government Charity over Private Charity. This might seem contradictory, but it is true. And so, as you can see from the data, John and Mary Doe are best off under a zero income tax system, where there is always more Private Charity than Government Charity. Private Charity is always better off under a proportional, not progressive, tax rate policy. And if the Private Charity believes that its concept of social justice is superior to that implemented by Government Charity, Private Charity should always press for low income taxes and a non-progressive tax system. And lastly, payroll taxes are very regressive as they put a very high effective tax rate on people who may hardly pay any income tax, the bottom 50% of all taxpayers. Yes, the payroll tax in fact is most unjust to the people at the lowest levels of the income ladder. And of course, this results in placing social justice of these lower wage earners at risk. But always, the greatest contributor to both Governmental and Private Charity is good paying jobs! Here is an excellent example in recent history of how incentives to leave the welfare system to get jobs had an extraordinary effect on Government Charity, Private Charity and the growth of the economy. The Personal Responsibility and Work Opportunity Reconciliation Act of 1995 (PRWORA, Pub.L. 104-193, 110 Stat. 20105, enacted August 22, 1996) is a United States federal law considered to be a fundamental shift in both the method and goal of federal cash assistance to the poor. The bill was a cornerstone of the Republican Contract With American and was introduced by Rep. E. Clay Shaw, Jr. (R-Florida) … . Bill Clinton signed PRWORA into law on August 22, 1996 under his promise to ‘end welfare as we know it’. TANF was created by the Personal Responsibility and Work Opportunity Act instituted under President Bill Clinton in 1996. The Act provides temporary financial assistance while aiming to get people off of that assistance, primarily through employment. There is a maximum of 60 months of benefits within one’s lifetime (some states have instituted shorter periods). In enforcing the 60-month time limit, some states place limits on the adult portion of the assistance only, while still aiding the otherwise eligible children in the household. While on aid, there is a component requiring non-exempt clients to attempt to find employment. Unmarried minor parents have to live with a responsible adult or guardian. Paternity of children must be established in order to receive benefits. These requirements have led to massive drops in the number of people receiving cash benefits since 1996 … . This is the perfect alignment of interests that occurs when companies that are making long term profits are able to hire willing workers who have overcome their needy status and become successful employees. Copyright © 2019 Fred Sauer Matrix. All Rights Reserved.